Life According to Steph: When should you start brushing your teeth and how much toothpaste should you use? 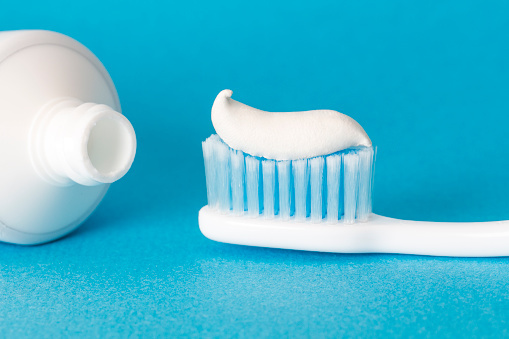 When should you start brushing your teeth and how much toothpaste should you use? One of my major life fears is the dentist, even though my dentist is, in actuality, awesome. Healthy gums and teeth are connected to everything else in your body, which is why I will never understand why dental is not a standard part of healthcare here in America. This all reminds me that I am way overdue for a standard cleaning. Taking care of your teeth is vital. You need to start paying attention to dental hygiene from a very early age. A major part of dental hygiene is dental cleaning. This is why you need to teach your child about the importance of keeping their mouth and teeth clean. You should also act as a good example by making sure you follow an effective dental hygiene routine. Toothpaste plays an important part in oral hygiene but you may not be aware of exactly how much toothpaste you should be using. We are going to explain why using too much toothpaste is not a good idea. We are also going to take a look at when you should start using toothpaste to clean your child’s teeth and how their tooth cleaning should progress. If your child is yet to get any teeth then it’s not necessary to use a toothbrush to clean their mouth; all that you need to do is use a washcloth and some water. This helps to remove bacteria from their gums. Once your child has teeth an age appropriate toothbrush should be used. It’s only necessary to add a small smear of infant toothpaste to the brush. If you use too much toothpaste your child is more likely to swallow it. Once your child reaches 2-3 years of age you should change the amount of toothpaste used; you should squeeze a pea sized amount onto your child’s toothbrush. It’s important to note that until your child is around six years of age you will need to either brush their teeth or provide a high level of assistance. Once they reach the age of six most children can brush their own teeth, although you may still need to provide some supervision to make sure that the task is completed successfully. How much toothpaste should an adult use? It may surprise you to learn that the amount of toothpaste needed to brush your teeth does not increase from when you are a toddler; a pea sized amount is sufficient. If you use more toothpaste than this it can act as an abrasive against your teeth and gums. It’s also worth noting that you need to brush your teeth for around two minutes if they are to be cleaned effectively. It’s very difficult to do this if you have to put up with a mouthful of toothpaste for that length of time; constantly having to spit out excess toothpaste does not make for an efficient cleaning session. You can see how important it is for you to start cleaning your child’s mouth and teeth from an early age. You should also make sure that you explain the process to your child so that they become aware of how important a good oral hygiene routine is. This helps them to take care of their teeth effectively as they grow up, and throughout their life. What about you? Any dental phobia? And have you been using the correct amount of toothpaste? Blood tests. IVs. Both were the worst things to me delivering 3 babies , all over 9 lbs, the boys were natural births. I just cringe and am ready to faint or puke at the thought of blood tests or an IV. Dental needles don't bother me! Thank Goddess! Grateful I have always been able to pay for my many dental bills; crowns especially! It's ironic that I have a dentist appointment today. I brush my teeth too hard. It's a tough habit to break though. I don't *mind* the dentist. It's kind of a timesuck though. Dentist doesn't bother me and I've had dental surgery twice. I have good teeth and the hygienist always makes me feel good about them, lol. Two minutes and only a pea size I'll have to remember that when I brush my teeth later today. I freakin hate the dentist. Hate. Every single time I've gone (except last time!!) I have walked out with a cavity/filling appointment. I brush at least twice a day, I take care of my teeth, I floss when I remember.... but my teeth are so close together and my mom used to put me to bed with milk bottles (which I've heard can mess with your gums?). So I HATE the dentist. I go once every two years and still walk out with on single cavity every time. UGH. I'm actually thinking about starting a whitening regiment. Any tips? i am not a fan of the dentist. i didn't take care of my teeth when i was younger, i do my best now, but i still have to go to the dentist more than i'd like to because of all that. i have a bad habit of cancelling my appointments though, so... yeah. i need to re-make my last appointment. boo. thanks for reminding me. GIRLLLLL.... I'm knocking on wood talking about dental things. Throwing salt over my shoulder, doing a hail mary & on my knees praying that I get a break from the dentist . Such great information! Thanks for sharing! always glad to learn more about teeth brushing! The ongoing endeavor. Thank you! I'm pretty sure I use too much toothpaste most of the time, so I need to watch that. Good tips! I used to hate the dentist. It was terrifying and they'd have to give me laughing gas. Not kidding! I finally found a great dentist though so I'm not too bothered anymore. I'm like you always dreading my dentist appointments for some reason... possibly because of feeling like you're under a microscope which can feel intrusive. But really it's so necessary for hygiene and not to mention good breath at the end of the day. Well this just slapped me in the face with the reality that I'm using too much toothpaste! Thanks for this! I really use this instructions, I use a washcloth and some water to clean my son teeth is easy to brush. My baby boy fights me so much when it comes to brushing his teeth I just don't know what to do to get him to stop fight and let me brush his teeth.